I can never get enough fresh fruit in the summer, and tropical salsas are a great way to sneak this warm weather favorite into a main course. Eager to try something new, I picked this Macadamia-Crusted Tilapia with Papaya Salsa recipe because it starred a lesser-known nutritional powerhouse: papaya. Only 60 calories, one cup of cubed papaya has 2 1/2 grams of fiber, approximately a day in a half supply of vitamin C, a third of a day's vitamin A, and significant sources of folate and potassium. Accompanied by mango and pineapple for a tropical twist, I knew this salsa was going to be good. Good could not be more of an understatement. This dish was outstanding. I literally felt like I was eating at a 3 star Michelin rated restaurant. The tropical fruit flavors burst out of the salsa via lime juice, jalapeno and rice wine vinegar for some extra acidity, and fresh mint contributed to a garden-picked feel. 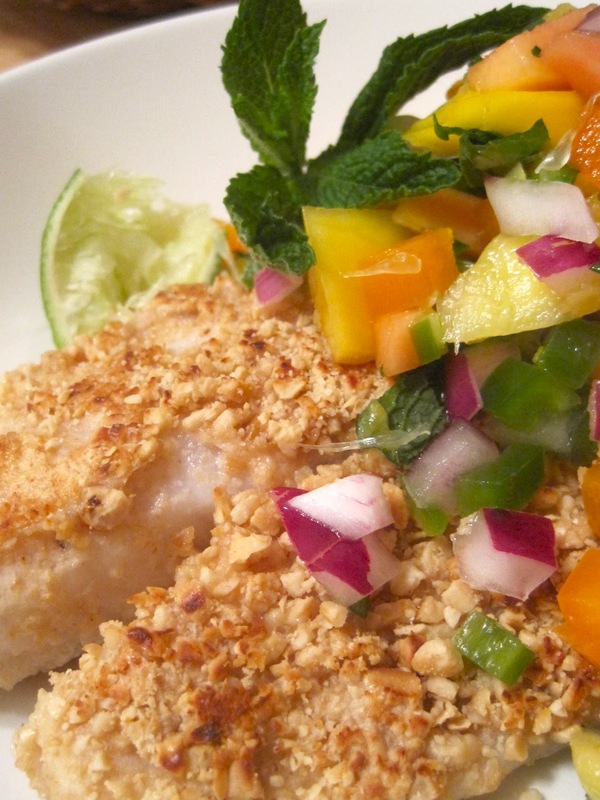 This juicy citrus topping was the perfect contrast for the fish - while its crunchy nut outside was crisp, it revealed a light and flaky interior. Of course, macadamias are a warm weather nut mostly associated with Hawaii, only adding to the dish's tropical feel. You could probably skip the pan-sauteeing in this recipe and just bake your fish, but that might eliminate the nutty crust which I found to be one of the best parts of the dish. To create the healthiest dish possible, I eliminated the olive oil from the salsa- it doesn't need it- and used whole wheat flour and egg whites to coat my fish fillet. I took the liberty to engage in a lot of substituting here and encourage you to do the same- based on your favorite herbs, mint can be substituted for cilantro or basil, and tilapia can be swapped for any white flaky fish- yellowtail, red snapper, or mahimahi are good alternatives. Cashews are a solid option if you can't find macadamia nuts. 2. Preheat oven to 350°F. Place flour in shallow bowl. Whisk eggs in small bowl to blend. Finely grind nuts in processor. Transfer nuts to another bowl. Sprinkle fish with salt and pepper. Coat fish with flour. Dip fish into eggs, then macadamia nuts, coating completely. Heat 2 tablespoons oil (or a generous spray with the olive oil spritzer) in each of 2 heavy large skillets over medium heat. Place 3 fillets in each skillet; cook until golden brown, about 2 minutes per side. Transfer fillets to large baking sheet. 3. Bake fish until just opaque in center, about 7 minutes. Divide salsa among 6 plates. Top with fish and serve. Center for Science in the Public Interest. "Pick A Papaya." Nutrition Action Health Letter 39.5 (2012). Print.